Children develop at an unprecedented rate during the first three years of life. Regular medical screenings can often slow or stop potential issues before they fully arise. Some screenings, such as pediatric hearing evaluations, can assess the need for early intervention hearing services. Hearing evaluations can also assist Speech & Language Pathologists in ruling out hearing loss as a potential cause of speech delay. If caught early enough in the developmental timeline, certain types of hearing problems can be treated by the physician and even prevented. An Audiologist can assist the physician in diagnosing these problems. What Happens During a Pediatric Hearing Evaluation? Different methods of hearing evaluations are used depending on the age of the child. Some tests simply involve the observation of behavioral reactions to auditory stimuli. These types of tests are appropriate for children who are old enough to respond to the audiologist’s directions in some way, whether verbally, raising a hand or just using head turns and eye movements. Other tests involve more advanced equipment and can evaluate the hearing in even the youngest of infants. How Can I Prepare My Child for a Hearing Evaluation? 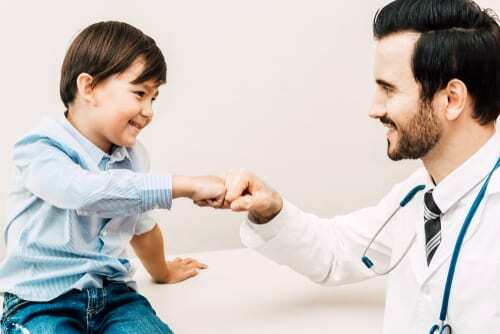 Since the testing type depends largely on the age of the patient, preparation for different kinds of pediatric hearing evaluations will also differ according to age. For the youngest of infant patients, no preparation is usually necessary. In fact, during several types of testing a child doesn’t need to be awake at all. If your child does need to be awake, there are a few ways steps that can aid in test preparation. If the test will involve earphones, it might be a good idea to introduce a set to your child beforehand so the earphones used in testing are not frightening. Another good tip is to practice the types of questions and answers that can be expected from a behavioral-based test. A child that has been asked to repeat words and phrases or asked to listen for a particular sound might be more comfortable in the actual testing situation. Although newborn and some infant screenings are routine, other specific situations might prompt a parent to specifically request an evaluation or a doctor to place a referral to an audiologist. If a child has had chronic ear infections, doesn’t seem to respond to sound stimuli in a developmentally appropriate manner or has been delayed in developing speech, this could be a cause for concern and prompt a pediatric hearing evaluation. An experienced audiologist will be able to assess a child of any age in a comforting and caring manner. Contact Oliveira Audiology and Hearing Center to learn more or to set up an initial appointment today.